The Scaff Boom Arm enables you to create a Boom Arm to suit your needs. Ideal for rigging small/medium moving lights, speakers, PA's etc. 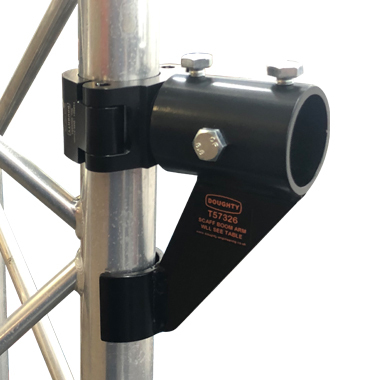 Featuring a 48mm receiver lengths of 48.3mm Aluminium Barrel or Galvanised Scaff Tube can be cut and drilled to suit. A pre-drilled 1.0m length of Aluminium Barrel which can be cut down to your requirements is available from stock (T57327). The Load table can only be used with Barrel/Tube supplied by Doughty Engineering Ltd unless you are certain of the material being used. (see user manual).